The Red School stood at the foot of Ashley Hill in Sullivan Township. The Red School District was in the north west corner of Sullivan Township, on the boundaries with Rutland and Richmond. In fact, some Rutland township students attended the Red School. 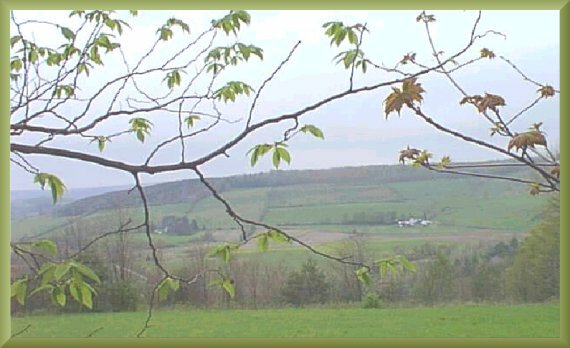 This Photo was taken by Joyce M. Tice on a misty day in April 1998 while standing on a stone wall on top of Round Top, looking north. (See the 1903 Elk Run School Page for Explanation of and location of Round Top) The photo shows the McConnell and Wood places on the border of the Red School and Elk Run School Districts. Even though the Wood Place was in the Elk Run School District, students who lived there went to the Red School because it was closer. 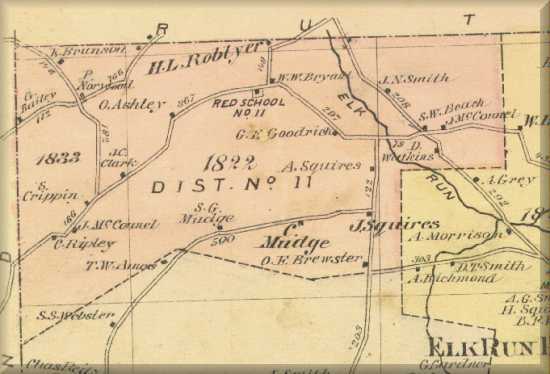 Conversely, in one year, Jim McConnell of the Red School District per the 1875 map, attended the Elk Run School. Either the district boundaries changed periodically, or chldren had some flexibility where they attended. In October 2009 I obtained from one of the local attics five school attendance books of Sullivan Township. They are Red School, Elk Run School, Hulslander School, Clark School and Scouten Hill School. These are particularly valuable because they cover that era of the missing 1890 census and may identify children who fell between the census years. 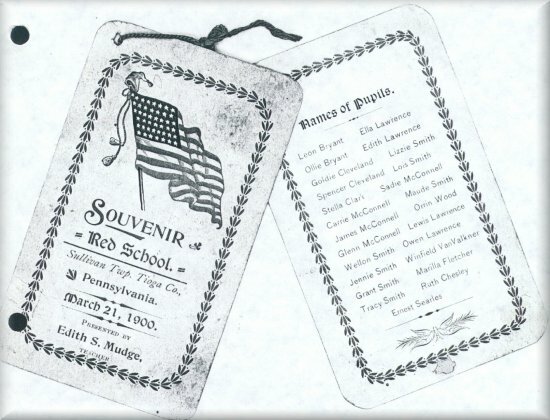 The books include the names and ages of the students, the teacher's receipt for pay, lists of books used in the school, visitors, and various statistics that were eventually consolidated at the township, count and state level for publication in the Pennsylvania Superintendent of Schools Annual. As I process this informaiton I will include it on the site, starting with Red School. From early times until 1892 a summer term was held for younger children and a winter term for the older children. Some of middle age may have attended both sessions. Teacher contracts were by the term. In 1893, the winter term was extended and a summer term eliminated. All children, regardless of age, went to the winter term school. Ollie Robbins was hired as teacher at the Red School [at the foot of Ashley Hill] for $15 which was paid on 09 June for term ending 29 May and $30 paid on 01 August for term ending 31 July . Her texts were Franklin Readers, Robinson's Arithmetic, Reed & Kellogg Grammar, Smith's Physiology, Swinton's Geography, Warren's Speller, and Spencerian Writing book. Information in attendance records in Joyce's Sullivan Township Museum - source: John Gray Strange house, probably from school board terms of his father, John Cooley Strange. Text: School session ran from 04 May to 29 May 1891 and from 01 July to 31 July. Also students not identified: Lizzie Smith, Bertha Knights. Participants: The following individuals are linked to this event: Lewis N. Wilson (Student); Dee McConnell (Student); Carl Gilbert McConnell (Student); Edward Avery (Student); Ross Sixbee (Student); Glenn Sixbee (Student); Nellie Elizabeth Smith (Student); Edith Sophia Mudge (Student); E. Blanche McConnell (Student); Ainsley Newberry McConnell (Student); Ned McConnell (Student); Sena B. Mudge (Student); May McConnell (Student); Myrtle Mae McConnell (Student); Addie Rosetta Mudge (Student); Emma Smith (Student); David Thomas Smith (Student); Wellon J. Smith (Student); Gertrude B. Clark (Student); Leon H. Bryant (Student); Jenny Lynn Smith (Student); Olive V. Robbins (teacher). J. S. Hopfer Taught the winter term at the Red School from 30 NOV 1891 to 24 FEB 1892 for which he was paid $81.15. Participants: The following individuals are linked to this event: Emma Smith (Student); Lee L. Smith (Student); Wayne Smith (Student); David Thomas Smith (Student); Wellon J. Smith (Student); Nellie Elizabeth Smith (Student); Lewis N. Wilson (Student); Henry Queal (Student); Edith Sophia Mudge (Student); Charles Beardslee Jr. (Student); Gertrude B. Clark (Student); Wellington Frank Clark (Student); Carl Gilbert McConnell (Student); Dee McConnell (Student); Addie Rosetta Mudge (Student); Frank Wallace Mudge (Student); Homer J. Clark (Student); Jenny Lynn Smith (Student); Elizabeth L. Smith (Student); Luella Smith (Student); J. S. Hopfer (teacher). Stella V. Goodall - Taught summer term at Red School 02 May 1892 to 03 Aug 1892. Paid $15 on June 4 and $30.48 on 03 Aug. Participants: The following individuals are linked to this event: Caroline Gray McConnell (Student); Edith Sophia Mudge (Student); Sena B. Mudge (Student); Ida Belle Austin (Student); Glenn O. McConnell (Student); David Thomas Smith (Student); Stella M. Fletcher (Student); Leon H. Bryant (Student); Gertrude B. Clark (Student); May McConnell (Student); Carl Gilbert McConnell (Student); Dee McConnell (Student); Ned McConnell (Student); Ainsley Newberry McConnell (Student); Nellie Elizabeth Smith (Student); E. Blanche McConnell (Student); Emma Smith (Student); Wellon J. Smith (Student); Jenny Lynn Smith (Student); Elizabeth L. Smith (Student); Luella Smith (Student); Stella V. Goodall (teacher). Colin R. Richmond teacher - School term 07 SEP 1892 to 07 JAN 1893. Paid $82.10 on 08 FEB 1893. He bought box of crayons 12 c, Water pail 25 c, broom 25 c, 2 erasers 25c, wash bowl 10c. Colin was the same age as his pupil Charles Beardslee. Participants: The following individuals are linked to this event: Nellie Elizabeth Smith (Student); Charles Beardslee Jr. (Student); Gertrude B. Clark (Student); Emma Smith (Student); Ned McConnell (Student); Caroline Gray McConnell (Student); Dee McConnell (Student); Charles J. Colony (Student); Wellington Frank Clark (Student); Homer J. Clark (Student); Carl Gilbert McConnell (Student); Wellon J. Smith (Student); Ainsley Newberry McConnell (Student); David Thomas Smith (Student); Jenny Lynn Smith (Student); Elizabeth L. Smith (Student); Luella Smith (Student); Colin R. Richmond (teacher). Edith R. Goodrich taught for five months of this term. Mattie E. Rumsey taught the final two months. On April 18, 1894 she was paid $23.42 which is probably not for the full five months. Earlier pay ecords may not have been recorded in the attendance book. Text: School Term 11 SEP 1893 to 01 MAY 1894. Wilson Wardell not identified in SRGP yet. Edith Goodrich taught first five months and Mattie Rumsey the last two. Homer and Frank Clark did not start until third month. Lucy Dann attended only four days in second month and returned in sixth and seventh month. Wilson Wardell attended from March 29 to end of term. Participants: The following individuals are linked to this event: Gertrude B. Clark (Student); Nellie Elizabeth Smith (Student); Caroline Gray McConnell (Student); Lucy H. Dann (Student); Wellington Frank Clark (Student); Homer J. Clark (Student); Emma Smith (Student); Wellon J. Smith (Student); David Thomas Smith (Student); Carl Gilbert McConnell (Student); Ainsley Newberry McConnell (Student); Charles Beardslee Jr. (Student); Ned McConnell (Student); Edith Hapeman (Student); Dee McConnell (Student); Elizabeth L. Smith (Student); Luella Smith (Student); Edith R. Goodrich (teacher). Text: School Term 20 AUG 1894 to 15 MAR 1895. Not all students attended every month. Wilson Wardell second month only. Frank and Homer Clark started in November. Unidentified: Lizzie, Ella Smith, Blanche Myers. Participants: The following individuals are linked to this event: Gertrude B. Clark (Student); Ethel M. Reynolds (Student); Homer J. Clark (Student); Jenny Lynn Smith (Student); Wellington Frank Clark (Student); Nellie Delia Stone (Student); William H Reynolds (Student); Caroline Gray McConnell (Student); Edith Hapeman (Student); Wellon J. Smith (Student); Carl Gilbert McConnell (Student); Dee McConnell (Student); Leslie R. Reynolds (Student); Grant L. Smith (Student); Nellie Elizabeth Smith (Student); David Thomas Smith (Student); Lewis W. Reynolds (Student); Claude J. Reynolds (Student); Elizabeth Ripley* (teacher). Text: School Term 02 SEP 1895 to 05 MAR 1896. Homer Clark did not start until November. Frank Clark started in December. Participants: The following individuals are linked to this event: Caroline Gray McConnell (Student); Edith Hapeman (Student); Florence Emily Mudge (Student); Wellington Frank Clark (Student); Homer J. Clark (Student); Elizabeth L. Smith (Student); Luella Smith (Student); Sena B. Mudge (Student); Edith Sophia Mudge (Student); Wellon J. Smith (Student); Carl Gilbert McConnell (Student); David Thomas Smith (Student); Grant L. Smith (Student); Dee McConnell (Student); Jenny Lynn Smith (Student); Gertrude B. Clark (Student); Lucy H. Dann (Student); Cora Ellen Webster (teacher). Cora Webster was hired for the 07 SEP 1895 to 16 MAR 1896 school term. There may have been a realignment of school disricts for this year: Many new students are included, a larger number, and some former students are no longer on the roll. Cora's salary was about $27 per month. Her school books were: Franklin Readers, Modern Speller, Robinson's Arithmetic, Maxwell's Grammar, Swinton's Geography, Webster's Dictionary, Smith's Physiology, Barnes' History, Spencerian Writing books, Maxwell's Language. Text: School term from 07 SEP 1896 to 16 MAR 1897. Unidentified: Owen Dyke, Harry Dyke, William Marble. Wilson Wardell started November. Tommy Smith and Carl McConnell did not start until October. Lucy Dann started in November. Erwin, Emory, Lizzie, Martha Wood started November, Blanche Myers started November. Jenny Smith started December. Frank Clark started January. Participants: The following individuals are linked to this event: David Thomas Smith (Student); Carl Gilbert McConnell (Student); Olive F. Bryant (Student); Goldie Cleveland (Student); Lucy H. Dann (Student); Jenny Lynn Smith (Student); Elizabeth S. Wood (Student); Jenny Lynn Smith (Student); Wellington Frank Clark (Student); Irving Wood (Student); Emory Wood (Student); Caroline Gray McConnell (Student); Martha E. Wood (Student); Luella Smith (Student); Leon H. Bryant (Student); Ned McConnell (Student); Wellon J. Smith (Student); Grant L. Smith (Student); Lynn Ananais Williams (Student); Charles M. Hagar (Student); James Asher McConnell (Student); Stella Clark (Student); Elizabeth L. Smith (Student); Winfield VanValkner (Student); Gertrude B. Clark (Student); Leonard Hagar (Student); Spencer Cleveland (Student). B. Ellsworth Beach - Hired in September, taught five months and was dismissed. School board records do not cite the reason. He was replaced for the last month of the six by Eleanor Rew. Eleanor Rew was hired to take the place of dismissed teacher Ellsworth Beach for the final molnth of the 97/98 term. Her reimbursable charges were a broom for 26c, 2 dozen pencils for 20c, a half dozen pencils for 5c and Stage Charges of 10c = total .71 cents. Text: Teacher B. Ellsworth Beach was dismissed after five months. Eleanor Rew replaced him for the sixth month of the term. The school board records do not identify cause of dismissal. Frank Clark and Gertie Clark did not start until mid December. Lelia Stone started late December. Unidentified - Emma Reynols age 9 started in January. Participants: The following individuals are linked to this event: Emory Wood (Student); Martha E. Wood (Student); Elizabeth S. Wood (Student); Winfield VanValkner (Student); Grant L. Smith (Student); Jenny Lynn Smith (Student); Lois Smith (Student); Ernie Searles (Student); Wilson Wardell* (Student); Lelia Frances Stone (Student); Gertrude B. Clark (Student); Wellington Frank Clark (Student); E. Blanche McConnell (Student); Burr Wood (Student); Clara Wood (Student); Elizabeth L. Smith (Student); David Thomas Smith (Student); Harry Chamberlain (Student); Carl Gilbert McConnell (Student); Dee McConnell (Student); Leon H. Bryant (Student); Ernest E. Chamberlain (Student); Frank C. Chamberlain (Student); Earl Joseph Chamberlain (Student); Albert Ulysses Chamberlain (Student); Henry T. Chamberlain (Student); James Asher McConnell (Student); Goldie Cleveland (Student); Spencer Cleveland (Student); Wellon J. Smith (Student); Glenn O. McConnell (Student); Olive F. Bryant (Student); Stella Clark (Student); Caroline Gray McConnell (Student); Eleanor Rew (teacher); Byron Ellsworth Beach (teacher). Fannie Clark taught the Red School for the term 05 SEP 1898 to 10 APR 1899. She had expenditures of 20c for crayons, 60c for lock and key, 20c for two blackboard erasers. Her salary was $23.00 per month. Text: Fannie Clark taught the term from 05 SEP 1898 to 10 APR 1899. In the first month 27 students attended. By the last month 11 remained. Some days were made up when the chimney was torn down. Sadie McConnell attended irregularly. Participants: The following individuals are linked to this event: Winfield VanValkner (Student); Elizabeth S. Wood (Student); Lois Smith (Student); Wellon J. Smith (Student); Irving Wood (Student); Jenny Lynn Smith (Student); Orrin Scaife Wood Sr. (Student); Martha E. Wood (Student); Sarah Kathleen McConnell (Student); Dean Nash (Student); Tracy W. Smith (Student); Ruth Ann Smith (Student); Grant L. Smith (Student); Hiram George Wood (Student); Elizabeth L. Smith (Student); Leon H. Bryant (Student); Ernest E. Chamberlain (Student); Frank C. Chamberlain (Student); Albert Ulysses Chamberlain (Student); Earl Joseph Chamberlain (Student); Harry Chamberlain (Student); Olive F. Bryant (Student); Henry T. Chamberlain (Student); James Asher McConnell (Student); Dee McConnell (Student); Glenn O. McConnell (Student); Caroline Gray McConnell (Student); Stella Clark (Student); Goldie Cleveland (Student); Spencer Cleveland (Student); Fannie M. Clark (teacher). Text: Edith Mudge taught the term from 21 AUG 1899 to 21 MAR 1900. She had from 19 to 22 pupils. She presented the students with a Souvenir booklet at end of year. Joe McConnell, son of James Asher McConnell, has the booklet. Participants: The following individuals are linked to this event: Owen Lawrence (Student); Winfield VanValkner (Student); Lewis Lawrence (Student); Marilla A. Fletcher (Student); Orrin Scaife Wood Sr. (Student); Goldie Cleveland (Student); Caroline Gray McConnell (Student); Ernie Searles (Student); Olaf C. Bryant (Student); Ruth Chesley* (Student); Maude M. Smith (Student); Spencer Cleveland (Student); Elizabeth L. Smith (Student); Lois Smith (Student); James Asher McConnell (Student); Jenny Lynn Smith (Student); Stella Clark (Student); Sarah Kathleen McConnell (Student); Leon H. Bryant (Student); Wellon J. Smith (Student); Glenn O. McConnell (Student); Ella Jane Lawrence (Student); Edith L. Lawrence (Student); Tracy W. Smith (Student); Grant L. Smith (Student); Edith Sophia Mudge (teacher).